Home > Travel > Vacation > G Adventures Reviews: Bargain or Bust? Do you daydream about taking a trip abroad but dread the planning process? Traveling abroad can be overwhelming, and for those of you who aren’t big on planning, G Adventures may be your best option. You can choose your destination and how long you want to be gone and G Adventures does the rest. 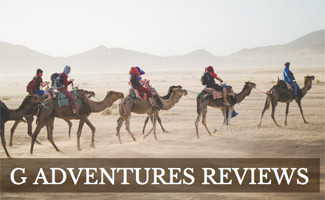 G Adventures is our top pick for best adventure travel. We’ll explain why we think G Adventures is great by laying out the key features, pros, cons, sample trip pricing and more. Below are some sample trips to give you an idea of pricing for G Adventures. We’ve gathered a G Adventures tours review from a couple of online sources to help you see what travelers love and hate about G Adventures trips. G Adventures recently acquired Swan Hellenic, which is a U.K.-based boutique cruise line. So, if you’re a cruise lover you may want to check out G Adventures, but not until 2018 (that’s when they plan to relaunch cruises). From the sounds of it, G Adventures hopes to revive the British cruise line and keep the same characteristics it had before the acquisition. The tours consisted of historical or cultural themes and were aimed at the upper echelon of cruise travelers. Where do you want to go with G Adventures? What all does the price include? Food? Tours? Ground transportation/transfers etc? It varies based on the trip. Some include food and shelter only while others also include transportation, tours, etc. Before booking make sure you read the details carefully. Have fun!